The Carl D. Perkins Career and Technical Education Act was enacted Congress in 1984. The Perkins Act authorizes federal funds to supplement state and local investments in what was then known as vocational education, but today is more appropriately branded as career and technical education (CTE). Congress went on to reauthorize the Perkins Act in 1998 and most recently in 2006, when, notably, just a single dissenting vote was cast against its final passage. Both students level of education, and what they study have a dramatic impact on their job prospects. The positive impact on graduation rates and earnings from Career and Technical Education was studied by John Bishop of the Cornell University ILR school in an article titled “The Impacts of Caree-Technical Education on High School Completion and Labor Market Success. Similarly, Everyone Graduates (a research program of Johns Hopkins University) found higher graduation rates from Career and Technical Education. Graduation rates are important because economies are demanding higher levels of education. Recovery, a report by the Georgetown Center on Education and the Workforce provides data on jobs, the education requirements, and skills most demanded by employers through 2020. They found that by 2020, the portion of jobs that will not require education beyond high school will fall to 36%. 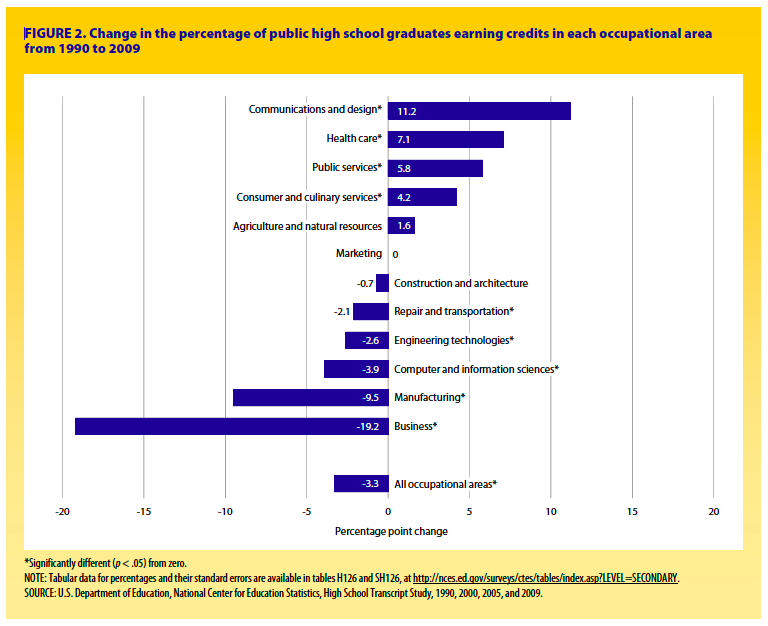 Alignment of Perkins courses with jobs in local economies is a second key policy question. Ideally, Perkins funds would be used to offset teaching courses in areas where the growth potential is high –the tech sector, which places a premium on science, technology, engineering, and math (STEM) education is a good example. Aligning coursework with local economic needs would not only reduce unemployment and fill job vacancies, but would also serve as a catalyst for economic growth. Alignment is just as important for graduates with Bachelors and higher degrees. In studies by the Georgetown Center on Education and the Workforce, they documented the earnings and employment prospects for graduates with different majors and level of education. The Georgetown Center on Education and the Workforce published a report, “Career and Technical Education: Five Ways that Pay” that identify 29 million “middle jobs” in the United States that pay $35,000 or more on average and don’t require a Bachelor’s degree. In many cases, the Center found in Certificates that even these jobs require certificates that Students could earn in an CTE program to get them a job and higher earnings. Aligning Perkins students with the skills necessary for these jobs is critical. Choice of major substantially affects employment prospects and earnings. People who make technology are better off than people who use technology. In general, majors that are linked to occupations have better employment prospects than majors focused on general skills. But, some occupation specific majors, such as Architecture, were hurt by the recession and fared worse than general skills majors. For many, pursuing a graduate degree may be the best option until the economy recovers. But, not all graduate degrees outperform all BA’s on employment. Unfortunately, as the economy continues to evolve, schools have been slow to react. Instead of working to arm students with the in-demand STEM skillsets that much of today’s economy requires, schools are still teaching increasingly dated material that is irrelevant to both students and the economy. Consider for a moment that while our national unemployment rate hovers around 7 percent, vacancies in STEM fields outnumber qualified applicants by nearly 2 to 1. Moreover, it’s expected that the 30 fastest-growing occupations in the next decade will require some STEM familiarity. Most states are still lack a definition of career readiness. In a Oct 2013 study by the Center on Education Policy, “only 14 of the 46 states responding to the survey said they have a statewide definition of what it means for high school students to be career- or work-ready. Unfortunately, academic skills dominate assessments of career readiness — rather than incorporating soft skills (such as teaming, time management), or technical skills (certifications). So in tackling the issue, it’s important to bear in mind that reauthorization of the Perkins CTE Act is just part of the equation. Modernizing the act to ensure that its funds are used to teach material that is relevant in today’s workplace would go a long way in both putting people back to work and jump starting economic growth.